The Long-finned Pilot Whales are seen swimming in Pleasant Bay during a whale watching excursion. The awesome mammals glide through the blue waters. The pilot whales are part of the dolphin family. Pleasant Bay is located in the Gulf of St Lawrence. Long-Finned Pilot Whales, Globicephala melas, seen during a whale watching excursion from Pleasant Bay in the Gulf of St Lawrence, Cabot Trail, Cape Breton, Nova Scotia, Canada. 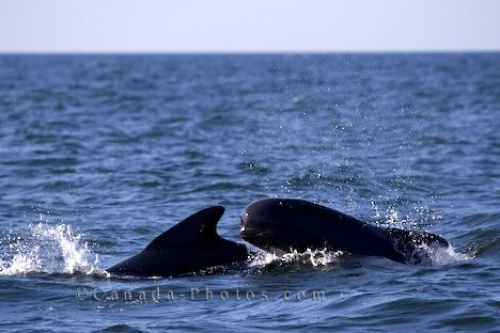 Long-finned Pilot Whales are seen gliding in the blue waters of Pleasant Bay in the Gulf of St. Lawrence.